A very mild blend, using predominantly flue cured Virginia, but with the addition of some sun cured both to cool and sweeten the smoke. A rough cut into very coarse pieces also contributes to cooling the smoke. A somewhat disappointing entry from the G&H stable. Disappointing to me, anyway. Most of the other recent blends I've smoked had a lot more on offer. This one is an overly mild and bland coarse cut of lemon virginia with some different curing methods to alter the flavor. I didn't get much flavor from this one, but the room note was wonderful! And not just wonderful to a pipesmoker - I got a fair number of favorable comments from others as well. This smoked naturally sweet rather than with the Lakeland essence. It got me wondering if some of those famous scents would spice this one up a bit. I just didn't find much of a personality with this one. It reminded me of a less citrusy version of C&D's "Ridin' The Raid". It's just sort of "tobacco" without a lot of character. This would possibly be a good entry point for the new Virginia smoker. Personal tastes are very different but this doesn't strike me as something a long-time smoker would derive much satisfaction from. It just lacks the full flavor of other G&H blends... and perhaps that was the point. 2 stars for me, but add a star if you like mild virginia blends. I'll go ahead and give this one a couple of stars since I'm sure it'd be a great smoke for my briar bretheren who enjoy lighter fare. I've smoked a bunch of G&H blends the last few years and this one has to be the lightest. The visual presentation is wonderful. In fact, the cut is unusually coarse. The burn (as you might expect from such a broad cut leaf) is slow and even. I doubt this one will bite those who like less full blends. But, I tugged a little too aggressively on my pipe in search of flavor and strength and wound up paying the price. This seems like high quality leaf, but it is very mild in taste and nicotine. Coarse ribbon cut that burns very readily and completely with little to no bite. I could detect no artificial flavors, just plain ole virginia. It lacks the typical sweetness that I normally associate with pure virginia blends; it has a spicy flavor similar to perique and more of a toasty flavor, similar to burley. The aroma from the can is pure natural leaf, almost undectable; surprisingly the Mrs. liked the room note. The tobacco just seemed a little bland to me. It would be a good blend for the yard/fishing/hunting due to the easy loading/lighting/burning characteristics. Appearance: A mostly rubbed out flake, predominantly orange/red in color. Fairly wide ribbons with some bits of flake still holding together. Aroma: Nice Virginia aroma with a bit of top dressing. I?m not positive of the source, but it reminds me of licorice. It?s quite delicate in application. Lighting: Usual two match light. No problem getting a charring light going. Initial flavor: The mild Virginia flavor jumps up right away, followed closely by the flavor additive. I still can?t be sure what I?m tasting, but it?s pleasant and unobtrusive. Mid-bowl: This burns surprisingly cool, probably because of the wider cut. Also remains dry throughout the smoke. Can you say monochromatic? Very little nuance in the flavor. Finish: Burns down to a clean dry ash with very little change in taste or strength. It leaves me wanting another pipe very soon, usually something else. Something stronger! Summary: A good choice for the Virginia newbie, and for a breakfast smoke (if your coffee is also mild). Useful for hot days, as it stays cool, and doesn?t tax your palate. Excellent quality leaf. I always think of Broken Scotch Cake not as a separated parts of some cookie, but rather survivors from random battle during scottish civil war, whose regiment was broken during the fight and now you wish to treat them with a pipe full of good Virginia sayings "cheers up, lads". Ok, it has some soapy taste, which I am not a great fan, but I must admit: that's the best soap you may smoke in your pipe for sure. Great buttery aftertaste. The taste of traditional butter fat, buttery biscuits... all right, now I get it why they call it a Scotch Cake. Broken Scotch Cake was a dedicated tobacco on a few pipe-smoking championships which I took a part in. 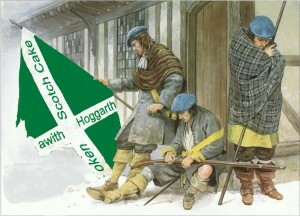 Gawith Hoggarth - Broken Scotch Cake. From the pouch I see a well broken cake, it's more like ribbons with only a few larger flake/cake like pieces in there. The smell coming from the bag is a very full Virginia one, it would be almost impossible not to be able to identify it as being so. The moistness of the rough ribbons is good and this helps it light well. The flavour of the smoke I think is a basic Virginia one. Grassy and citrusy without being too sweet. Instead of the Virginia sweetness there is an almost herby quality there which I find quite fresh. The nicotine is fairly mild, maybe far too mild for a nicotine smoker. I wasn't really too enthralled to try this one, I assumed it might be a bit simple but it's the simplicity of the smoke that I enjoy. Three stars. This was a good smoke! It's quite similar to Sam Gawith's Golden Glow (maybe because of the broken state of flakes) but carries a hint of Lakeland scent, really just a hint. Excellent packing and burn, not too hot, and for a pure VA very forgiving and rewarding. Delivered enough N for breakfast. Blob shows "Coarse Cut", I would call it a mix of ribbons and broken flakes. Cool smoke, light flavour, little strength. Full score, but remember that this is not your usual VA. Aro lovers and Lat fetishists move on, nothing to see here. I divide the G&H tobaccos into two categories: The light brown tobaccos and the dark tobaccos. BSC is my favorite in the light brown range. It comes in a sort of pressed form which requires a little bit of rubbing, but you can pinch it up and load the pipe that way. It does require a bit of drying to bring out its better qualities, and it does have a slight bit of the G&H flavoring additive, or top dressing which I find in their light colored tobaccos, but much less than in, say, their Brown Flake or CR Flake. For me this tobacco has no bite and delivers what I am looking for in this type of tobacco which is the distinctive taste of Virginia. I buy it in bulk and smoke a bowl every other week or so as a very pleasant change from my usual Virginias. Highly recommended. Paddy. This sample was a gift from a friend. It is mostly rubbed out tan medium ribbon with a few brown bits and some small hunks of flake that did not get rubbed out. Pouch note is slightly grassy with some earth. Hydration was maybe slightly on the damp side. I smoked it as delivered being careful not to overpack. Smoked, this is a good straight Virginia with just a hint of Lakeland every now and then so you know it really came from G,H & Co. The smoking experience is mild. There is not much punch and the Virginias are good but not especially exciting. The flavor is mostly hay with a little sweet. It was easy to smoke slowly and it burned cool. This is good and not challenging. I have no regrets. It is not likely to be something I will get, but I could smoke it all day if it were what I had. It is a solid 2.5 on the scale. For someone with a nicotine intolerance who wants a tobacco flavored smoke, this might be just the thing. When I first started smoking this blend about four years ago, I like many others, felt it was too light in the flavor department and tossed it in a jar and forgot about. After revisiting it four years later, a few years didn’t change my mind completely, but it did improve. Very light Lakeland flavor, mild and now a bit sweeter than when new. It does burn clean and like all GH blends; the tobacco seems to be of high quality. I’ll finish the jar but won’t buy it again. If you like Virginia's, and are looking for a light Lakeland style blend, than this could be an option, but for me, Bright CR Flake by the same blender is a better choice. If you like strong/aromatic tobaccos, I think you won't care much for Broken Scotch Cake; the experienced and more demanding palate may find it rather bland and dull. On the other hand, this would be a good tobacco for the newcomer to try, or for someone who doesn't want a pronounced or pungent flavour. It's a mild, sweet, undemanding and natural-tasting Virginia; smooth, civilised and straightforward. I can't detect any casing; if there is one, it's very unobtrusive. BSC is a cool and dry smoke that burns evenly and well. I don't notice any great change in the nuances of flavour as the bowlful progresses. Of course it's better sipped, but you can puff away quite hard without getting your tongue fried, and you won't get a nicotine overdose either. As the name suggests, it presents a fairly chunky appearance; you can rub it out a bit more if you need to, but you'll speed up the burn if you do, of course. I'm happy to recommend it, especially to the beginner. At first I found it a bit too bland, but the more I smoked of it, the more I came to like it, and I now number it among my favourites. It suits a big bowl and a long, contemplative, indoor smoke. SWMBO doesn't mind the room note, which is another plus point. BSC reminds me a bit of Fribourg and Treyer's Golden Mixture (now unavailable in the UK): pleasant and undemanding, and a good all day smoke if you're an all day smoker. Also, it's not a million miles away from the ready rubbed version of Capstan that's available in the UK, with the same sweet, grassy taste. If you want something a tad more flavoursome, it's nice mixed 50/50 with Ogden's St Bruno. Superb stuff, in my opinion. Similar Blends: Fribourg and Treyer's Golden Mixture. I noticed the reviews for this tobacco tend to be of the “like it” or “leave it” type. This is very understandable, as the initial pipe was somewhat elusive. Taking note from several reviewers, I decided to hold off judgement until I was able to smoke a quarter of of the 16oz I had ordered. I did leave in the jar for 6-8 months until I could wait no longer to try this blend. It is true, this is a very mild blend in flavor, aroma and nicotine. The bowl tends to start slightly spicy which can be misunderstood as a potential tongue biter, but this changes to a nicely creamy smoke. It does not bite, but if pushed hard, it could be a tongue tingler. The flavor shifts between subtle Virginia grass/hay and some elusively subtle sweetness. It is not a flavor bomb, but is deeply rewarding in its softness and the more you smoke over time the more the tongue can find the subtle shifts in flavor, in spicy to a toffee sweetness and then to a herbal creaminess. While this is not my favorite, I do look forward to the next pipefull of this tobacco. Since I smoke outside only, I only occasionally get a room note and the smell on my beard is soft and gentle. I like this blend for everything it’s not as I have not had anything I can really compare it too and it rewards me for slowing down and enjoying my pipe. Again, this is not a flavor bomb and does require a little bit of time to atune to the flavor profile, but it is very rewarding for taking the time to do so. Edit: I must add a slight edit to this review as it is super important to ensuring you get the most from this tobacco. This tobacco will be over whelmed by a pipes previous cake. So when smoking this blend, to really allow it to shine, either dedicate a pipe or scrape down the existing cake in your pipe. Once this blend establishes itself in your pipe, all the subtlety of the blend will move forward and will be more consistent in its flavor. Don’t know how I missed mentioning this before, but it really needs to be mentioned. If you like going from dark rich heavy tobaccos, to lighter blends, then you will be baffled by why people like this blend. If you are able to set a pipe aside for mild blends or better, dedicate a pipe to this blend, then you have a much better chance of really enjoying what this blend has to offer!!!! When I began smoking this was a favorite of mine. A very mild VA, it has the perfect moisture content for a quick light and a bowl that stays lit the whole time. Coarsely broken strips that easily pack, a fairly uniform reddish brown color, and a nice VA smell. Quality stuff and highly recommended for the beginning smoker or someone who favors a lighter blend every so often. Don't try to puff hard to gain more flavor. Take it very slow and you will be rewarded with a flavorful experience. If you are coming off a more powerful blend, sit with this one for a few days and you'll start to appreciate it more and more. I'm going through my cellared stash of tobaccos now as I probably can't buy any more and smoke it before I myself am ash, so most of my further reviews will be from aged tobaccos. This is made from a base of broken medium Virginia flake, similiar to Samuel Gawith's Medium Virginia Flake. To this fine tobacco, an interesting topping has been added. Some describe it as a Lakeland Scent, or perfume. I wasn't quite sure what to make of this at first, but I've since tried Cannon Plug, so it seems a little more normal. I haven't taken to the flavour of this tobacco as much as cannon plug, but it is applied much more lightly. The topping is strongest, of course, on the charring light and mellows out fairly quickly, although it remains throughout the smoke. The topping doesn't mask a fine tobacco, however, and Broken Scotch Flake makes for a nice all day smoke for those with a sweet tooth, but no desire for the hot scented steam that is an American Aromatic. I bought the unscented version. A unique blend that is a blond color and very coarse cut. At first go-round this one was too understated. I would recommend this one as your first smoke of the day or before any really strong tobacs. If given a chance to shine by itself, it is excellent. It does have a touch of the Lakeland Floral "soap" taste. The Virginnia is tangy and sweet. It does have a bit of a kick to it from the nicotene content. Since purchasing a 5 sample trial pack of Gawith & Hoggarth tobaccos, I've come to enjoy a couple of them on a regular basis. One of these is Broken Scotch Cake. I find it to be just a good no-nonsense tobacco, though maybe a little mild for some puffers who prefer the heavier blends. I tend to go with BSC as an everyday, anytime, good utility smoke, like an old stand-by. The color is a mixture of browns and the cut is shredded with some 'flake bits' mixed in. I just pull some apart when I fill a bowl just to assure there is no bunching together to impede the draw. It lights very well and burns easily to a light grey fluffy ash. While smoking there is that familiar VA tang which in this case is like the after-effects of a mild salsa, just enough to tingle a bit. The flavor, to me, is just a good honest VA tobacco flavor with just a hint of natural sweetness (as compared to cherry, maple, etc. sweetness). There is an airiness in the smoke that would allow easy exhaling through the nose, and that 'tobaccoey' scent lingering in the mustache. In some ways it reminds me of GLP Cairo but not in the flavor sense, more in the smoking sense. The smoke is cool and soft with that slight edge I mentioned staying pleasant all the way down the bowl. There is an underlying and very faint citrusy note during the first half of the bowl, but it's subtle and changed to the rich flavor found in the last of the bowl. It's like a char-broiled taste. The sample came with just the right moisture level (at least for me) and translated to very little moisture in the pipe. It gurgled once about halfway down the bowl, and one swab with a cleaner took care of it. The room aroma reminds me of a dear family friend whose pipe has provided me with a lot of fond memories over the years. IMHO this would be a good tobacco for anyone, but newbies should be somewhat cautious not to puff too hard and get the heat rising. Just a good VA smoke. Broken Scotch Cake: A coarse ribbon cut that is a mild & high quality tobacco from G&H... seems naturally sweet w/a minimum of the Lakeland essence... almost like a bread & butter smooth taste. Had no bite & buns cool. I tried it last summer whilst fly fishing & easily packed & re-packed my pipe whilst stream wading... even got passers-by commenting on the great aroma. This is not a robust type but an all day baccy. It is not awefully complex however a good smoke. I recommend it. 3+ stars. Age When Smoked: 2+ yrs. Similar Blends: Capstan Blue, MacBaren Va No 1, Samuel Gawiths Grousemoor Aro. (But Milder!). A mild smoke... but with a lot of body.. and a typical light g&h soapiness.. but light enough where it doesn't really bother me.. not complex at all.. but cool and easy.. lovely aroma..solid Virginia but no stand out flavor notes.. maybe toasty breadiness with a subtle sweetness.. and smooth floral undertones.. I love the cut.. reminds me of the cut of one of my favorites.. scottish cake ironically.. pleasant with nothing to complain about other than being one dimensional.. certainly pairs well with a warm beverage. Another contender for all day smoke. Good smoke for any time if the day. Packs well and takes the match well. Some initial sweetness and hay as well as just a tinge of Lakeland essence. Not a powerful blend but a solid smoke none the less. Pairs well with cup of Earl Grey or Irish Tea. All in all a very good quality smoke from G&H, just like the rest of their fine tobaccos I have smoked. A mild virginia. Almost imperceptible, but evident, taste & aroma of Lakeland Essence on charring light and a tinge of an 'ammonia' odour in nostrils, but very faint. Background: I've been smoking mostly G.L.Pease Union Square and his Triple Play & JackKnife plugs, as well as Navigator. Whether that leaves me with a well-adjusted 'virginia' palate and nose others can judge!! The tobacco is slightly spicey in the first 1/3rd of a bowl, relatively bland in the next 1/3rd and left a modest dottle with some reasonably strong 'nasties' in the last 1/3rd [which I didn't smoke into!]. Nothing spectacular - pleasant enough - modestly tolerable room note. Not special. This tastes like floral soap. Which stays in my mouth long after smoking. My pipes also needed the salt alcohol treatment to remove the ghosting. Didn't care for it at all. I think this mild scotch cake is an excellant entry into the Va tobacco world. Similiar to Davidoff 'Scottish Mixture", and a few other mild scottish/scotch mixtures, even She Who Must Be Obeyed likes this room note. Light and airy where her exact words. Out of the mouths of Babes..... Lights well, smokes cool, mild scotch flavor to go with a tobacco taste that is very satisfying. This tin has all but disappeared; time to order LOTS more. It shows va characteristics from the char. Bermuda hay, mixed with lespodesia (sp) alfalfa. Grandpas farm cutting time. And, in the back, is that damned juicyfruit taste. Gotta love it. This is a Va type that is a good smoke at any time. I like many of the Gawith & Hoggarth tobaccos, but some of them tend to bite me, notably any that have a lot of bright Virginias. This is one of them. It reminds me a bit of Coniston Cut Plug, which bites me a lot. This bites me somewhat, presumably because of the addition of some richer medium Virginias and a bit of latakia. It requires very slow and careful puffing to enjoy, but still, bites me somewhat, even with careful puffing. Interesting light body and toasty mellow flavor, well behaved in the pipe, but not appropriate for my body chemistry. YMMV. Tin: A partially rubbed out flake that looks like an incredibly variegated form, crudely stuffed into the tin. It appears to be of the orange or red variety, middle to old belt, having a mahogany hue, the browns ranging in the light brown spectrum. It has a fragrant natural VA smell. Feels like it is at just the right moisture level. Packing & Burning: Readily rubs out into ribbon form, packs and lights easily. Burns to an ash with one match. Taste & Aroma: Initially very mild fragrant Kendal floral scent and lightly sweet, transitioning to a toasted, stoved, or a nice char-broiled taste. Reminds me of BCRF with less of the Kendal floral scent. No bite, just a mild salsa. Overall: BSC has the least floral note of GH's blends I have tried. Too much nicotine to be an all day smoke. 3.5 stars. First half of the bowl: fairly flat taste (2 stars), with the typical floral essence taste (which is neither bad or good). Second half: full and creamy Virginia, great finish ( three and a half star). Overall rating: 3 stars. Recommended for those who want a really 'refreshing' smoke. This is a pretty solid tobacco... The first half of a bowl is generally so-so - it's good, but not great. It's very much hindered by that sort of soapy lakeland flavor.. I don't really know what's so keen about that perfumey taste, but it's thankfully light. Getting down to about a quarter of the way to half way into the bowl, though, that perfumey flavor dissipates into a wonderful, smooth, tasty flavor emerges and the Virginia really shines. This is my favorite tobacco when I am sipping a dram of the single malt. It just goes so well with its namesake. When first I opened the can I was a little dismayed. This can't be right...it is all the same color in there. The can note is not significant smells kind of like sweet tobacco none of the soap and perfume you get with some of the other Lakeland blends. It burns well and smokes well. I would smoke it all day, but it is pricier than my regulars so it is reserved for the weekend. And I am working for the weekend. It is also very nice with a bold cup of tea. Try it. Slainte! This is a beautiful tobacco in both appearance and taste! I only discovered it about 5 months ago and have purchased several 500g bags of it since. It is one of the most pleasent tobaccos I have ever smoked in terms of its burning qualities, coolness, and creamy Virginia flavor. It isn't a very complex smoke. It does, however, change from a naturally sweet, creamy taste at first to a light toasty flavor with just a hint of that Virginia "twang", for lack of a better word. There is no bad aftertaste. I do not detect any burley. It is just a tad moist right out of the bag. It burns to a nice grey ash. This is a special smoke to me in almost every way. Then again, I like natural tobaccos that are somewhat light to medium in strength. Definitely an all day smoke!! UPDATE: After aging for 3 years I have tried more of this. The flavor, while nicely aged, seems to have gained in strength considerably! It could be that my tastes have changed. It does burn very well but just doesn't seem to have aged like I thought it would. Maybe it's this cursed Texas heat! This would no longer be an all day smoke for me. Others have touched upon the classic Lakeland soap taste they experienced with this blend. I may have gotten the ?bottom of the barrel? (or ?the top of the barrel?) in my tin as all I could taste was the overwhelming presence and taste of soap and perfume in several bowls in several different pipes from beginning to end. I never tasted any tobacco flavor. Perhaps this is a quality control issue and the tobacco in my tin was overly scented but I won?t be trying it again. I rate this tobacco 1.00 out of 10. I recently discovered Broken Scotch Cake and I'm impressed with its quality and flavor. I love the creamy smooth taste and the gentle citrus tang. I don't find the flavor as mild as advertised; I would call it medium. Fans of Bosun Cut Plug and Conniston Cut Plug might find it a little too mild in strength. This could be a wonderful all-day smoke, if that's what you're looking for. I really like GH blends, particularly the natural ones like Bright CR Flake and Brown Flake. I think BSC is as good as the aforementioned blends. I wish it was made in flake form, but the coarse cut burns slow and even, so it's not a huge deal. I wonder what a little perique would do for it. I'll get back to you. A very nice flue cured Virginia. Cut from flake form and rubbed out most completly. Packs easily,and lights with two matches. The first taste is Lakeland district tobacco flavoring,but is most restrained,and almost hardly noticeable through the very pleasant Virginia taste. This blend almost reminds me of Sam Gawith's Grousemoor,but don't let that sacre you away here,it's different. On down the bowl it has gained a almond toastiness,and yes,a creaminess as well. The taste/flavour is good,and as soon as you're done with a bowl full you want another. I haven't tried a whole lot of G.H. tobaccos but of those I have tried so far this is my favorite. This is perhaps one of the brightest colored blends that i've smoked with the exception of GL Pease Stratford. This is very similar to stratford. I know that Greg Pease is a big fan of G&H blends so I have to assume that this blend influenced him in a big way towards the making of Stratford. This is a bright, light and slightly sweet blend. The burn is very even and consistant and smokes cool for a blend of this genre. I gave this a higher rating than Stratford because right out of the tin it was very good where as Stratford took aging to reach its potential. They are both very good and I highly suggest them both if you like Bright virginia style of blends. Another thing to note is that my palate felt very clean after smoking this. A refreshing smoke! This is definately worth buying a few tins for aging in that I suspect that it will get even better with age. Highly recommended! Mainspring's review above says it all for me. This doesn't displace Brown Flake as my favorite natural GH flake, but its a very close second. The flavor is less dark, but the hay-like character comes through more strongly as a result. It smokes as cool as Brown Flake. It is natually sweet, smells wonderful in the pouch and not bad in the room. Give it a try! My bulk purchase consisted of nicely prepared flakes ~ 6" long x 1.5" wide of brownish VAs with some golden birdseyes. The moisture content was much < my preference and resulted in the tobacco crumbling in the pouch and especially during packing. This might have been older stock from my supplier but I couldn't bring it back to life. Normally, I don't rub out my flakes. It still smoked cool and dry without a hint of bite and was easy to light and keep lit. In addition, family felt that it had one of the better room aromas for a VA flake. It was mild enough for an all day smoke but failed my taste buds. I sensed a soapy undertone to the creamy, smooth taste that just spoiled the experience. Although not nearly as prevalent as with their Ennerdale Flake, perhaps this is a result of G&H processing or the VAs from Brazil or Zimbabwe that may be common to both blends. This tobacco is described as a fully rubbed out flake even though it is called a crumbled cake. I would consider it a shag cut, but call it what you want, that's ok. It is my current tobacco of choice. I love the aroma and the taste. This is a straight ahead taste with a bit of initial creaminess. It tastes great all the way through the bowl. I can not tire of it, and feel guilty about all my other opened tobaccos that have been deligated to a lower status. I could go on raving about this blend for a long time, but I would rather go and smoke another pipe full. This is a good VA. It was designed to be a very mild smoke and GH has accomplished that. The bright VA's provide a very light grassy and citrus note. There is a slight floral note but GH likes to use VA's from Malawi and I find that they have a slightly floral flavor much more so than VA's from the US. The flue cured portion also had a slight woodsy/fresh saw dust taste that seemed to come and go. This is far from a complex VA but still enjoyable. The VA's are sweet and never got harsh, bitter, or cigarette like in any way, even when pushed. Don't push this blend, however, the notes that I got from the first puff are all I got so slow and steady keeps the bite away. Not much nic in this blend either. It will not satisfy a craving but I don't think that was the intention here. It is wonderful as a first pipe of the day. I preferred it with a cup of Darjeeling tea as coffee overpowers the flavor profile. It is also great as an afternoon smoke on days off. I am an outdoor only smoker and now that summer here is underway I enjoy a lighter blend in the afternoon. This fits the bill quite well. I did not get any "lakeland sent" as noted above I think the slight floral note is from the VA's and it did not ghost any of my pipes. There was something there that I could not quite put my finger on and so I am leaning toward an extremely mild top note. This may also be the reason for the very pleasant room note. It was so nice even my cranky old neighbor yelled that whatever it is smells good. To which I replied not to get to use to it because I was about out of the 2 oz. sample. This will not make one of my regular rotations but I think I will pick up an oz. or two occasionally for the late summer months and to smoke around others with such a pleasant room note. I found this offering to be a very smooth smoke. A wonderfully mellow, clean Virginia that seems to "cleanse" the palate when moving between English blends. A slight perfume to the taste that reminded me of aged Dunhill's Mild blend (even though the blends differ). The room note is nostalgically pleasant. Similar Blends: Dunhill's Mild Blend. There's no Lakeland 'essence' flavoring on Broken Scotch Cake, the (exceedingly mild) perfume here comes from the sun cured tobacco and a healthy dose of placebo-effect reviewers who taste essence on anything made by a Kendal manufacturer. It's definitely a mild blend, nic fiends need not apply. It's sweet, with a good whiff of sun cured, and the rough cut makes it smoke very cool. Comes out of the tin as a brick and breaks up easily. It burns fast, but is almost impossible to get tongue bite from. Broken Scotch Cake is everything I wished Mac Baren's Virginia No. 1 was, although the sun cured adds a very noticeable fingerprint to the blend. It's probably closer to McClelland 24 than anything else I can think of. Of course, being both light and from Kendal it's criminally underrated, but more for me! This wasn't at all what I had expected. Reading the other reviews here I am wondering if the bulk package I got today is even the same tobacco. My sample isn't broken flake at all. It is a fuzzy shag. It isn't bland at all, or mild. A friend who was present, and not smoking, said that the smoke had a pleasant vanilla scent. That having been said, it was a fine after-dinner smoke tonight. The licorice flavor was the real problem with this blend. It gave me a slightly sick feeling. Like many G&H blends, it is a well-crafted tobacco, and it has weird flavoring because that is what this blend is supposed to taste like. If I liked licorice I would love this stuff. Comment = Smooth, Medium Strength, this is a little Bitter, slight After Taste. This packed nicely, lit easily, and smoked smoothly. I don't know about other tins, but there was not a hint of Lakelands or other flavorings in this batch that I could detect. Despite all that, I found the actual flavor rather 'meh' -- one note that I didn't like that much, but wasn't in any way bad. This is a very unassuming and relaxing English blend. It is not heavily flavored or very charactered in any particular way. This smooth smoking blend is for times when you do not want to think too much about what you are smoking, but would rather have a somewhat detached experience with a calm and balanced English blend. There is a subtle/mild but detectable warm spice about this blend. Just got some Broken Scottish Cake from G&H. To my taste very much like Sam Gawith's Medium Virginia Flake (which recently is rather hard to come by) if a bit spicier and with a little more character. Not really a "serious" blend such as the heavier ones by both of the "Gawiths"- but then again just the right thing for those times (such as morning or late evening) when something not so fulsome or aggressive is called for. Similar parameters to Medium Virginia Flake. Aftertaste: Very pleasant - a plus for me! A generally all round pleasing smoke. A straight-ahead blend. BSC has a nice sweetness, but its body, flavor, and mouthfeel are just way too weak for me. Another VA type flake though from a excellent company. Perhaps I expected too much from BSC, but to be honest this just seems very average. It burns very well with little rubbing out. It lights easily and burns very evenly. The flavor is kind of citrus-like at the atart and mellows as you smoke it. So whats the problem? When compared with some other VA type flakes like S. Gawuth Full Virginia Flake and some of McClelland's offerings, this just underwhelms. I didn't hate it. Its just..fair. It is a ok all day light V.A , nothing special though.